Earlier this year I reviewed Emma Cooper’s book, Jade Pearls and Alien Eyeballs, a book describing a slew of unusual, edible plants to try in the garden. Many of the plants profiled in the book sounded fun to grow, so I decided to try at least two this year: oca and Hamburg parsley. I didn’t get around to growing oca, but I did manage to produce a miniscule crop of Hamburg parsley. Hamburg parsley (also known as root parsley) is the tuberous root forming variety (var. tuberosum) of garden parsley, Petroselinum crispum. Native to the Mediterranean region, P. crispum has long been cultivated as a culinary herb. It is a biennial in the family Apiaceae and a relative of several other commonly grown herbs and vegetable crops including dill, fennel, parsnip, and carrot. 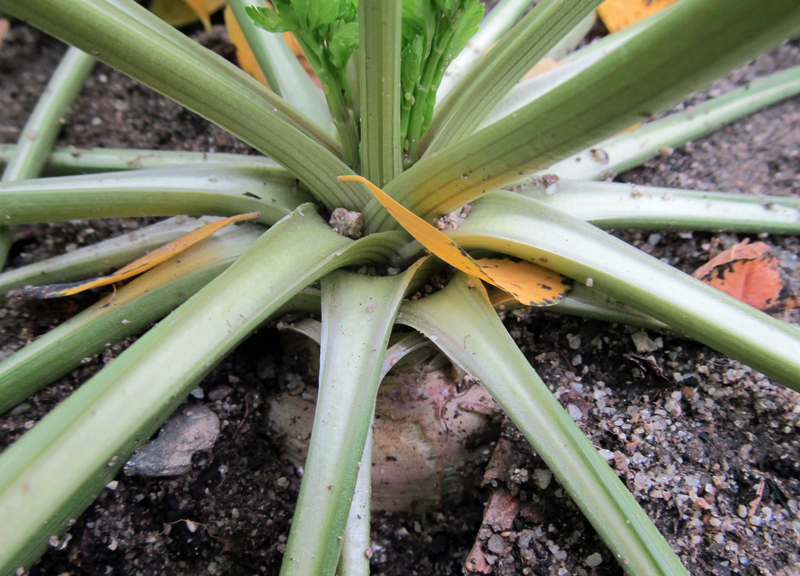 In its first year, the plant forms a rosette of leaves with long petioles. The leaves are pinnately compound with three, toothed leaflets. Flowers are produced in the second year and are borne in a flat-topped umbel on a stalk that reaches up to 80 centimeters tall. The individual flowers are tiny, star-shaped, and yellow to yellow-green. The leaves of Hamburg parsley can be harvested and used like common parsley, but the large, white taproots are the real treat. They can be eaten raw or cooked. 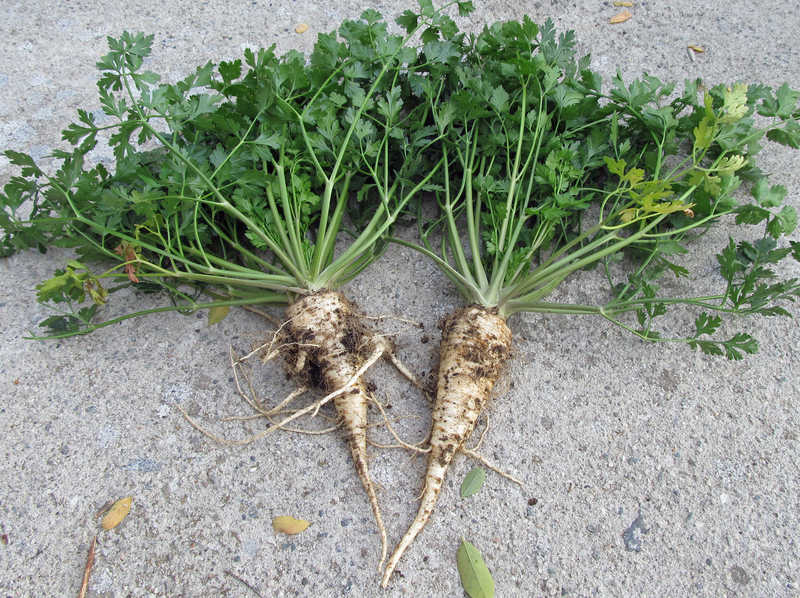 Eaten raw, they are similar to carrots but have a mild to strong parsley flavor. 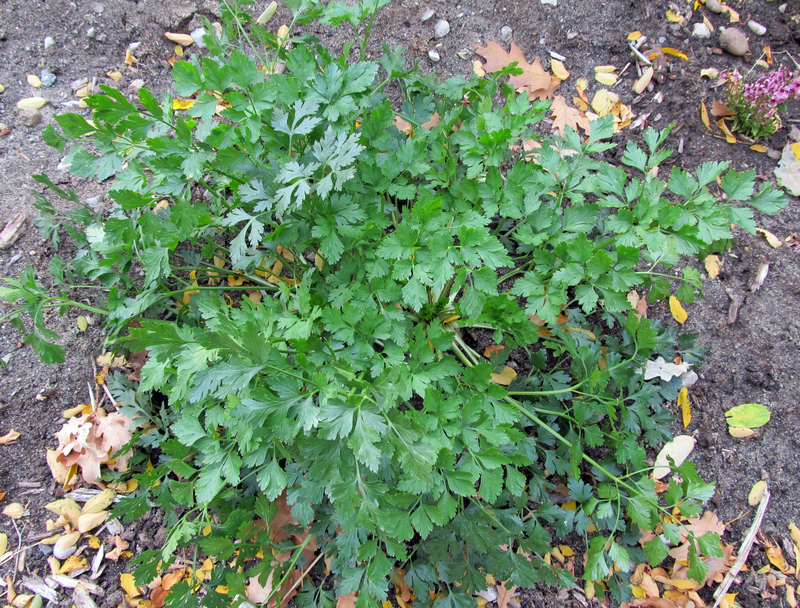 The bitter, parsley flavor mellows and sweetens when the roots are roasted or used as an ingredient in soups or stews. Despite sowing seeds in a 13 foot long row, only two of my plants survived and reached a harvestable size. Germination was fairly successful, and at one point there were several tiny plants dispersed along the row. Most perished pretty early on though; probably the result of browsing by rabbits. Generally, parsley seeds can be slow to germinate, so when they are direct seeded, Cooper and others recommend sowing seeds of quick growing crops like radish and lettuce along with them to help mark the rows – something I didn’t do. My harvest may have been pathetic, but at least I ended up with some decent roots to sample. Raw, the roots were not as crisp as a carrot, and the parsley flavor was a little strong. I roasted the remainder in the oven with potatoes, carrots, and garlic, and that was a delicious way to have them. If I manage to grow more in the future, I will have to try them in a soup. Did you try something new in your garden this year? Share your experience in the comment section below. This entry was posted in Horticulture and Agriculture and tagged Apiaceae, Botany, edible plants, Emma Cooper, gardening, Hamburg parsley, horticulture, Jade Pearls and Alien Eyeballs, parsley, Petroselinum crispum, plants, root parsley, unusual edibles, vegetable gardening. Bookmark the permalink. We have neighbors who had a rabbit for a while and it would escape their house and come eat our garden. But I think they no longer have the rabbit or it no longer gets out. Anyway, fascinating. I want to gt a hold of that book.